I knew it would happen eventually, and I think during week 3 it happened: we got into an iPad groove. So in some ways that makes this week’s reflection really fabulous, and in some other ways it might make it really boring. After the first week of highs and lows, and the second week‘s videos, I was excited to see what Week 3 would bring us. I was hoping that it would bring some sort of “normalcy,” where we wouldn’t have our noses constantly in our iPads and were somehow thinking of them as tools instead of toys. And to some extent that’s what happened. 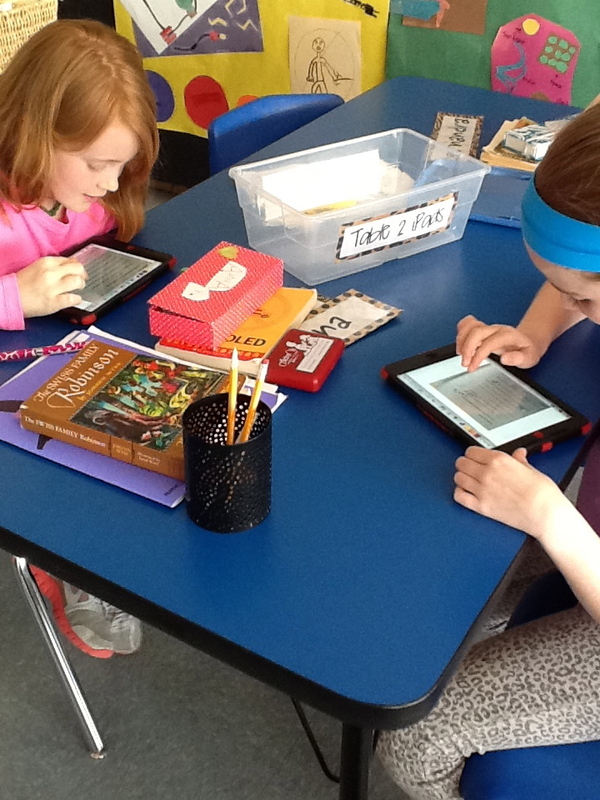 The most exciting part of the week for me, I guess, was how my kids are starting to come up with really great ways to use our iPads to enhance our learning. We’d already been using Educreations for annotating videos explaining our learning, using Notability to mark up text we were reading and taking pictures to help us save documents we could use later easily in another place. And up to that point, much of what I was asking them to do with their new tools (outside of the iMovies they’re making for fun, blog posts they write for themselves and some other stuff like Edmodo) had been my idea. Then we started talking about poetry. As like with every other unit, they were to publish their pieces, self-evaulate using our writing rubric, and then turn in their work (not rocket-science, I know). And ZB had a great idea of how to do it. Just like we had been doing in Educreations to explain our thinking in math, ZB had an idea of how we could do the same thing for writing. 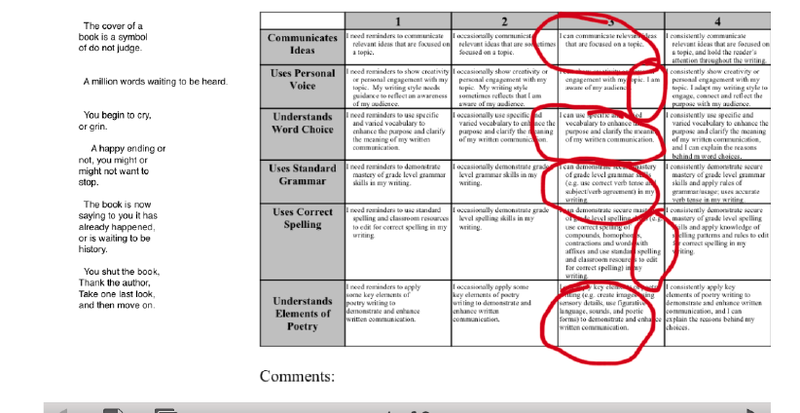 And as they scored themselves on the rubric, they could explain to me why they thought their poem showed that, and could make connections to the text of their poem at the same time. This type of thing, before we had our iPads, was possible, but would take FOREVER because I’d have to have a separate conversation with each writer in order to gain the information about their thinking. Great idea, ZB! Now, I must take a minute to insert a short story of a frustrating “apportunity” we had related to these videos. It’s related to the fact that Educreations is a GREAT place to create videos, but not such a great app to use if you want to do anything with those videos. And of course I didn’t know this until after we’d done all kinds of work with it. As I struggled to find a way for my kids to be able to share their work with me, I found this FAQ on the Educreations website that helped me find an answer to my problem. A negative answer. Lame, right? Yeah…great information I wish I’d had before we started. And so this meant that what I had thought were great opportunities for my students to share their thinking with me were now just stuck on their iPads. Well, unless I wanted to lug them all home. Which was kind of not the point of going 1:1 and being electronic and such, you know? 1. You can get around the exporting problem if you sign up for an Educreations account. That way you have the option of emailing your video to someone or copying the URL link of to post or use. I found out I can also give my students a course code that will allow me to have access to their videos via the website. They don’t even have to send them to me now; I can just click on each students’ file from one screen at the same time. 2. Notability also works in a similar way, and can be more easily shared or saved in Dropbox, Evernote, or a variety of other ways. 3. Explain Everything is a great app that combines all of the things that both Educreations and Notability can do, and has many other great options that will grow with your students as they get older and/or learn to do new things with their devices. Downside? It costs $2.99, but does offer a volume discount if you buy in bulk. We’re considering this one as an option to Educreations. 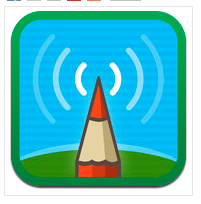 Doodlecast Pro could do the same thing, and might be great for younger students (it’s also $2.99). So this past week was technically Week 4, but with MAP testing taking up much of our time and energy, there is not a lot of iPad news to share. The one thing I will mention, though, which I guess fits in the “high” category, came from our class meeting today. 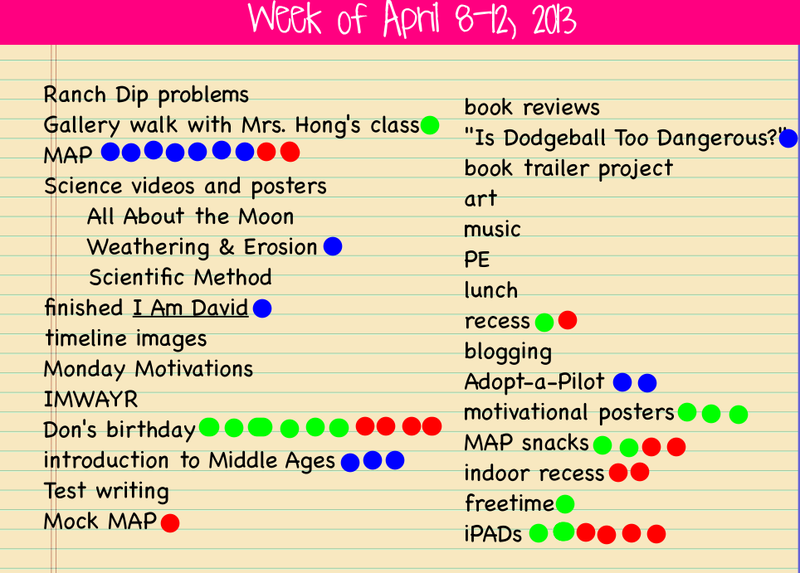 The red dots mention are what kiddos wanted to talk about. Their conversations could be positive or negative, but these are the pressing issues of the week. Ok, so I know Don’s birthday was a big topic of conversation (because many people wanted to wish him well and tell him how awesome he is), but they also wanted to talk about iPads. What I loved was that unlike past weeks conversations when there was a lot of discussion about what NOT to do, today they wanted to talk about how great it’s going! The discussion was about how we’ve all figured out how to do things, aren’t playing around so much anymore, and how they’re helping us as learners. Of course I was interested in hearing more about that last thing, so I dug for evidence. They mentioned things like being able to get and send documents to me electronically instead of having to always get papers, as well as how easily they can look up answers to things they’re wondering about and just how much more interesting doing their work on the iPads has been. And I’ve been excited at how much more collaboration there has been in spite of everyone being 1:1; many people worry that kids will be “plugged in” constantly and not interact with other students. I’m happy to see that this hasn’t been the case in our room so far. We’re just finding better ways to collaborate, communicate and curate. 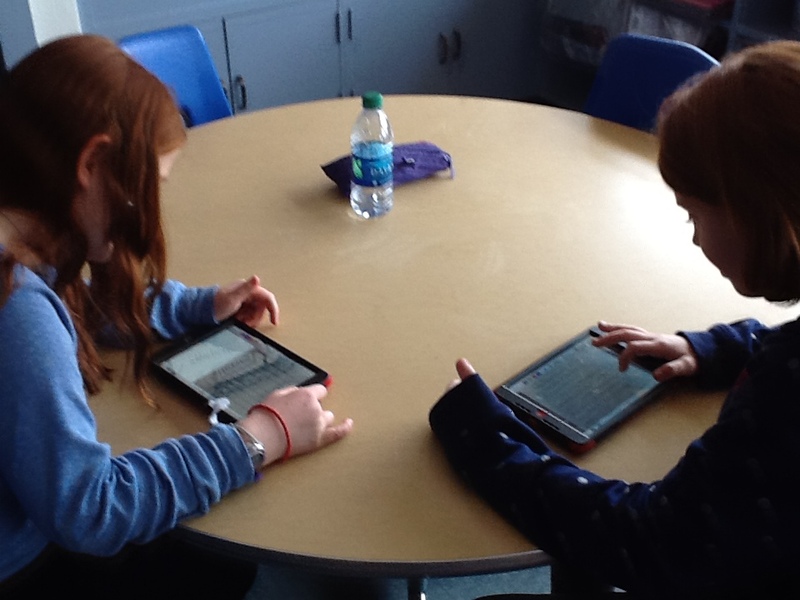 Don and Ames look at a common text on Educreations as we practice editing together. Anna and Fiona can look at the same text on their separate devices as they discuss how they’d improve the paragraph to make it easier for the reader to understand. 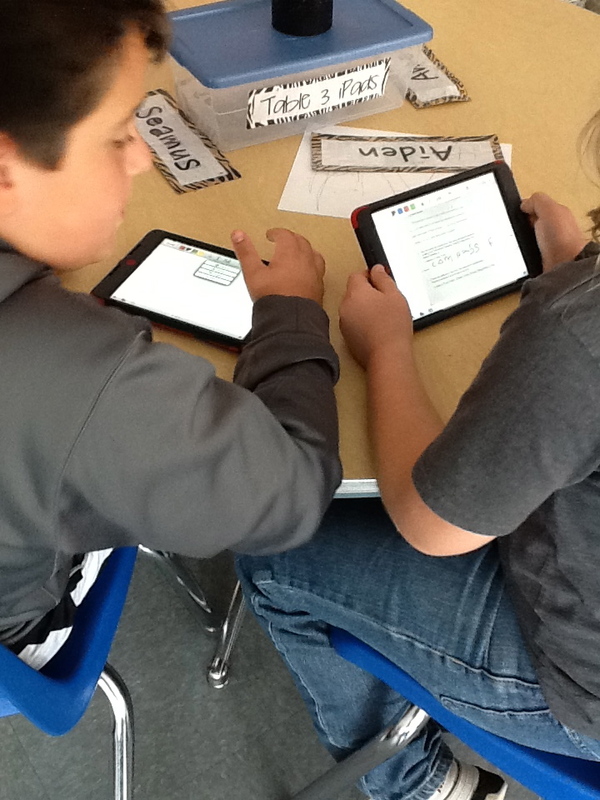 Since they’d uploaded the picture into Educreations, they can mark on the text right on their iPads and then save their thoughts to come back to later. 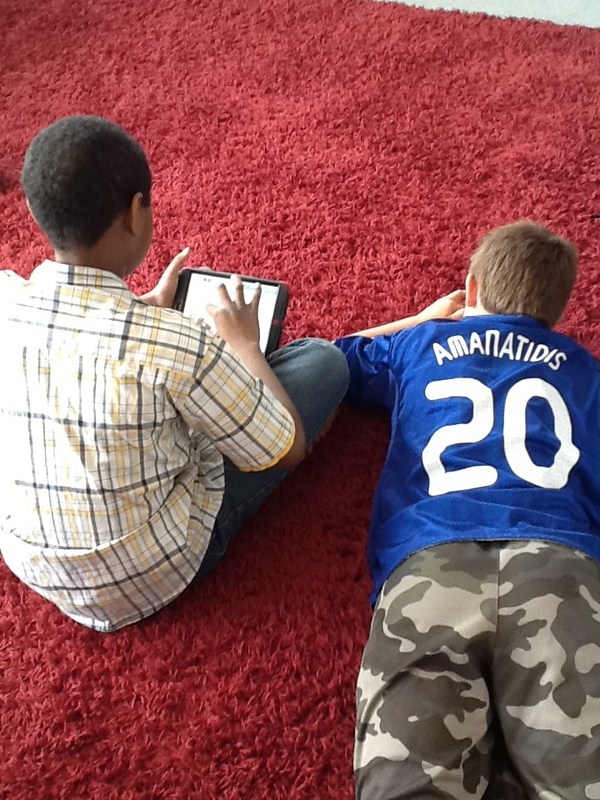 Devan and Peter work to edit punctuation and capitalization in a text uploaded from our shared Dropbox folder. 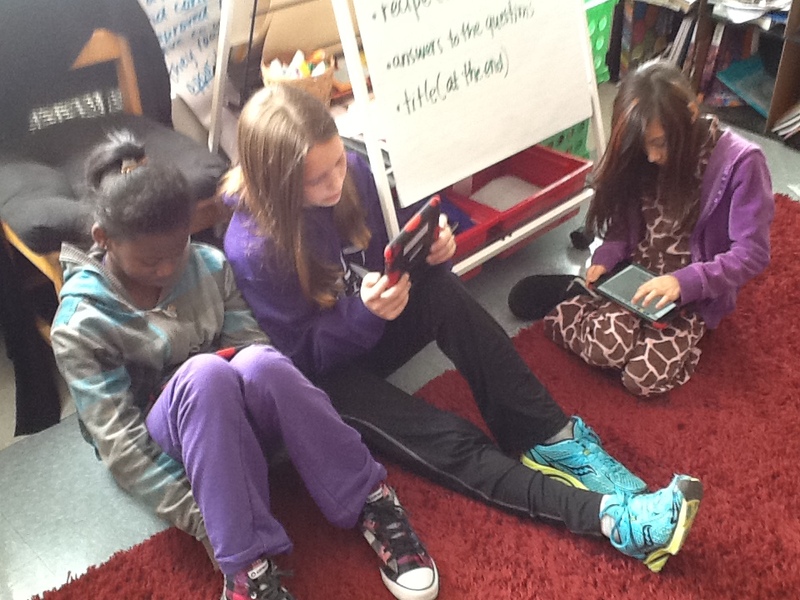 iPad minis make it easy to have everyone look at the same text at the same time, but then interact with it in whatever way works for them as a learner. And they’re portable and small, making them easy to go anywhere–even the rug–unlike when we were only using our laptops for these kinds of things. So we’re about halfway home. 4 weeks in and 4 weeks to go in the Scout. And with MAP finishing up this next week, we’ll have some more time in our schedule to explore what our iPads will help us do. Stay tuned for more on the book trailer project we’re in the middle of. That is definitely something that would have been inconceivable before we were 1:1. Exciting times ahead! Posted on April 26, 2013 by Jen Bearden	• This entry was posted in Classroom, Technology, Writing and tagged apps, iPads, reflection, technology, Writer's Workshop, writing warm-ups. Bookmark the permalink. Your post has been a huge help to me – thank you! My students will try out Educreations for the first time tomorrow and thanks to you I have a plan for them to share them with me! The ipads are on a cart shared by the whole school -1000 students – so storing work on iPads are impossible. What do you mean? We had fun when you were here–just different fun. Not iPad fun. By the way, you’re leading tours tomorrow for Movin’ in the Middle, right? Excited to see you again!